MNDFL Beauty December 6, TORONTO! 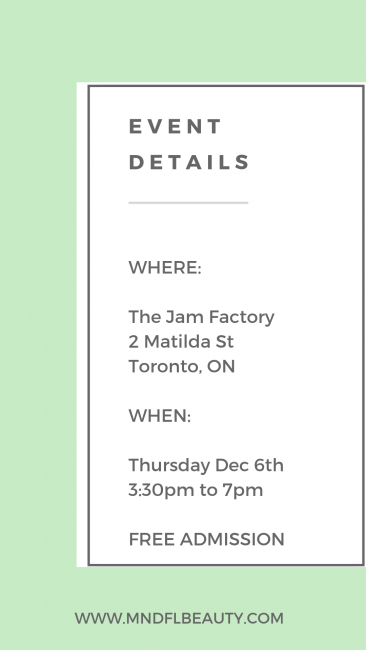 MNDFL Beauty is a brand discovery and shopping event featuring the most awesome Green Beauty brands that Canada has to offer, hosted by Graydon Skincare! Not just a shopping event, this is a truly unique opportunity to meet brand founders in person, and ask them your burning skincare questions! This year there will be over 30+ INCREDIBLE beauty and wellness brands! Mark your calendars now! FREE ADMISSION! We are also hosting an evening VIP Cocktail Party! As you get cozy with brand owners and do a little shopping, you will receive a premium swag bag full of goodies (over $100 value!!) and sip on a complimentary green cocktail provided by Greenhouse Juice Co! Tickets are on our Eventbrite page. kaia naturals, Living Libations, Basd body care, Schaf Skincare, Wildcraft Care, Province Apothecary, Sahajan Skincare, Zyderma HS, Pura Botanicals, Aromacentric, Sappho New Paradigm, Helena Lane Skincare, Clean Kiss Organics, East Coast Glow, Shoosha Truly Organic, Étymologie Skin Care, Suncoat, Anointment Natural Skin Care, Plume Science, The Andrea Olivera Centre for Ayurveda, Iremia Skincare, Buck Naked Soap Company, Muni Muni Skin Care, boosh, Merben International, and more!! This is the perfect time to do your holiday shopping, and stock up on gifts that aren’t only beautiful to look at, but clean, natural, and so good-for-you. ← How did Anointment transform from soap to a best-selling New Mom & Baby skin care line?